Passers-by with a keen eye may have noticed a log building being constructed east of Hwy. F in New Melle over the past several months. The building is located at Work Horse Construction, 93 St. Charles Street, and is attached to the company’s existing office/warehouse building. 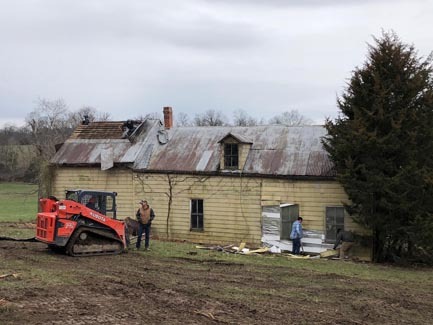 The cabin was originally located on a Backhaus family farm northwest of Augusta. 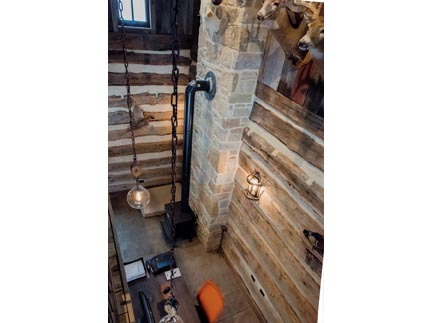 Brock Harvey, owner of Work Horse Construction, has always loved log cabins. He was able to obtain the cabin from the Backhaus family through the help of Tim Kilby, owner of Country Gentleman Restorations in Defiance. 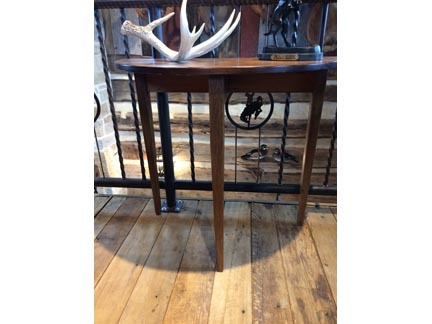 Kilby is a nationally recognized expert in antique log, post & beam restorations and relocations. He had first approached the Backhaus Family almost 20 years ago about possibly doing something with the structure. 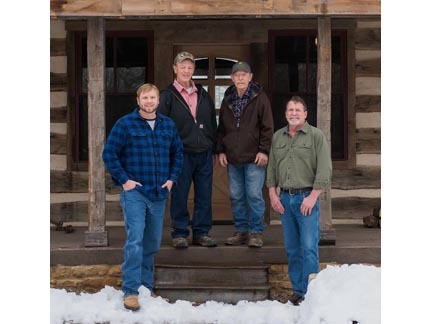 The cabin had been in the Backhouse family since 1884 when August Backhaus (Ron’s great great-grandfather) purchased the property, at the age of 28, from August Schmalzinger. August Backhaus paid $6.25 per acre ($500) for the 80 acre parcel that included the log house and other outbuildings. Schmalzinger had bought the property in 1853 from Michael Wittig for $4.50 per acre. Wittig had purchased the tract from Christian Jaspering in 1840 for $1.25 per acre. 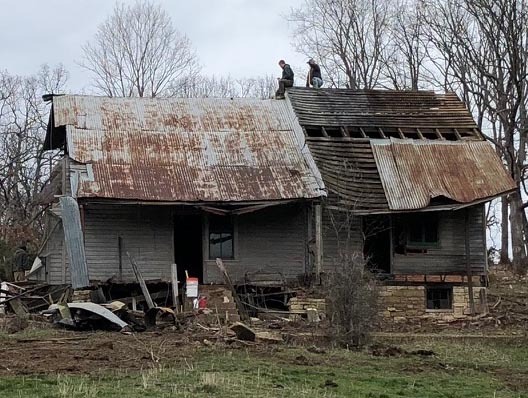 It is not known exactly when the cabin was built, but Kilby said there are three cabins in that valley (all on different parcels of ground) that have a common thread, though he believes one is several years older than the cabin that was on the Backhaus farm. August Backhaus and his wife Catherine (nee Schnarre) had five children: Herman, Hilda, Eldon, Frieda and Alma. Eldon and Hilda never married and lived in the house together after their parents died. Hilda passed in 1979 at the age of 86. Eldon Backhaus died in 1985 at the age of 80. There was a certificate showing that the house got electricity in 1957, and a note that yellow aluminum siding was added in 1979. Over the years, two additions had been built onto the cabin – a kitchen on one end and a bedroom on the other. In March of 2018, Brock and a number of Work Horse employees led by Dominic Eggemeyer, started taking the house apart. They removed two layers of siding (aluminum and clapboard) and the two additions. That exterior siding, plus plaster and wall board on the inside, helped preserve the logs. The bottom sill was rotten from being in contact with the ground. Brock said each log still bears the original Roman numeral markings that were used to first assemble the structure. As they dismantled the cabin, they tagged pieces and piles and made notes to help with the reconstruction. 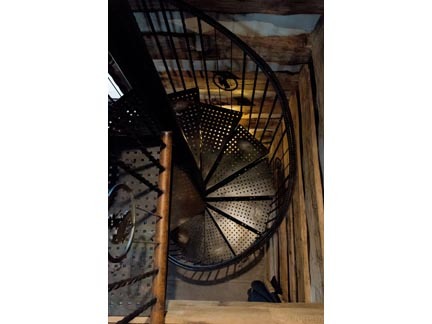 They salvaged and reused what they could, including the original oak floors and the interior doors. Tin that was on the roof now covers the ceiling on the inside. Stones from the foundation were used to build a new fireplace. The original rafters were round logs. They could not be reused because they no longer comply with building codes. 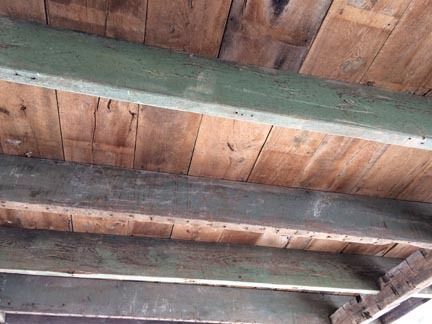 However, some of the second story floor joists, which still bear a faded green coat of paint from an era gone by, now serve as rafters for the porch, which was built using mortis and tenon construction. To kill any existing bugs or fungi, the old wood was power-washed, acid-brushed, and let to dry in a warehouse for about 6 months before it went back into the cabin. There was a lag time between the time the cabin was disassembled, and when it was reassembled – due to engineering and permits. When it came time to start reassembling, Tim helped get the building started, laying out the first few layers of logs. Tim also taught Brock and his workers how to chink it – with “real sand/cement chinking” – not a mix you buy at the store. Once all the logs were reassembled, an addition was built on top, adding about 3 feet of height to give the second story more head room. 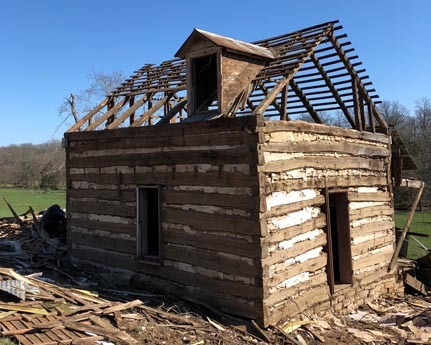 The interior walls of that addition are covered with weathered wood boards that came from a barn on the Backhaus property and other local structures. The cabin measures 19 ft. 1 in. x 18 ft. 2 in. and now sits on a concrete foundation. The locations of the doors and windows on the lower level are all in the same locations that they were in the original cabin. The fire place on the east side (built from the foundation stones) fills in the doorway that once led to the bedroom addition. Three of the interior doors have been reused, but the front door and all the windows themselves are new. Brock said this was definitely a “Learn as you go” experience. “Tim helped a bunch, and the Backhaus’s were super hospitable,” he said. 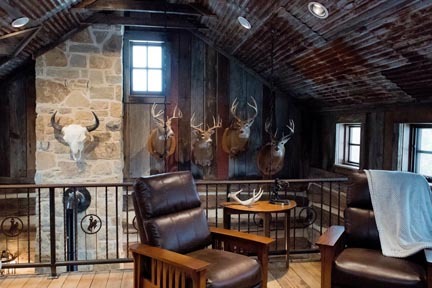 Brock Harvey is now using the restored cabin as his office, and he’s happy to show it off a little when time allows. Brock founded Work Horse Construction Group in 2008 and has steadily grown the company, building a reputation for quality, service and integrity. Tim is encouraging Brock to get more involved in the restoration business, and Brock has a couple of possibilities on the horizon. To learn more visit www.workhorsecg.com. The completed cabin - attached to the existing Work Horse Construction office/warehouse building. 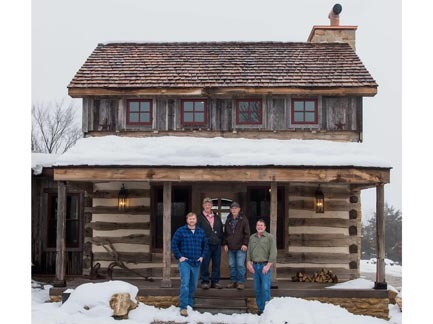 and Tim Kilby - Country Gentleman Restorations in front of the completed cabin. The back of the house “before”. The log part is in the center with the dormer window. The front of the house after one of the additions had been removed. The back of the cabin before it was disassembled. 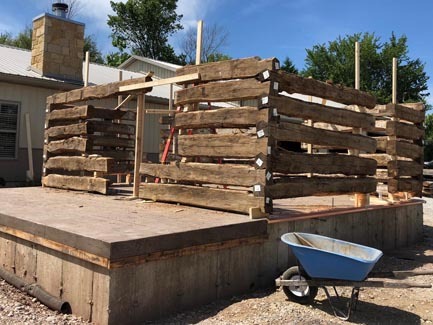 The concrete foundation and the first few logs being reassembled. The upstairs loft. 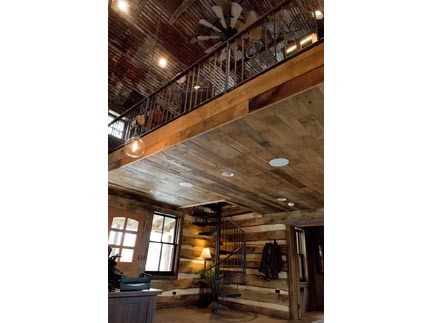 Notice the tin ceiling, barnwood walls, and stone fireplace, all repurposed from the original site. 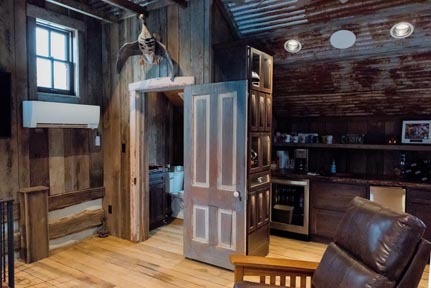 Another view of the loft, with one of the repurposed doors. View from the balcony to the office below. A view from below, showing the staircase, balcony above, and tin ceiling. wood recovered at the site of the original log cabin. Photos 1, & 2, 7, 8, 9, 10 & 11 courtesy of Carrie Harvey, Harvest Bloom Photography. Photos 3, 4, 5, & 6 courtesy of Brock Harvey. Photos 12 & 13 Boone Country Connection staff photos.